For any object moving through a fluid, forces are applied to the object as the fluid moves around it. A fluid can be something like water, or even something like the air around us. When the object is specifically designed to maximize the forces that the fluid can apply, you can designate these designs as airfoils. A more common name that most people would use is a wing. The shape of a wing, or airfoil, determines the forces that are applied to it when it moves through a fluid or the air. These forces also depend on the speed of motion through the fluid and the direction of flow around the airfoil. With all of these parameters, how can you design airfoils? How do you optimize airfoils for a particular use? You need some way of analyzing all of this information—specifically, you need software that can run the numbers and do the calculations. 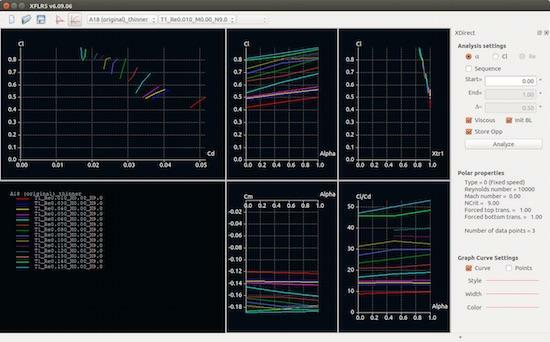 There are very complex pieces of software that can analyze hydrodynamic problems in the abstract. But, with airfoils, you can limit the problem to such a degree that the equations are greatly simplified. One of the software packages available to do these kinds of calculations is XFLR5. XFLR5 started as a fork of the much older xfoils program, but it has been extended with extra functionality. That command should install the XFLR5 documentation package as well. When you start XFLR5 the first time, it is not very flashy. In fact, on my system, I end up with a plain black window. Although you can design your own airfoil from scratch, doing so can be fairly tedious. It is much easier to take a previously designed airfoil as a starting point and make alterations. 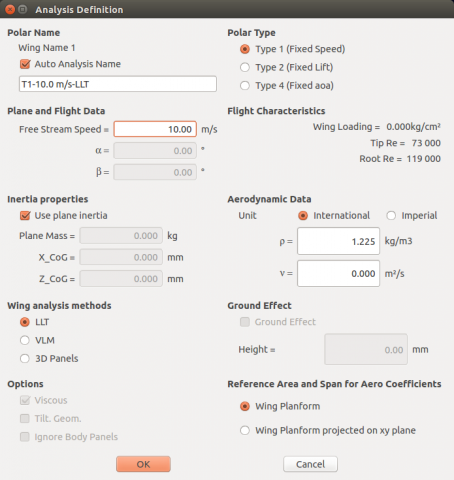 A good database of airfoil designs is located at the UIUC Airfoil Coordinates Database, containing nearly 1,600 airfoils. The database contains DAT files, which contain the information you need to use in XFLR5. They also have GIF files, allowing you to see what the airfoil looks like before downloading the DAT file. Once you choose one, download the related DAT file and open it in XFLR5 by clicking on the menu item File→Open. Figure 1. Opening a DAT file loads the data and switches to the polar view. You can change the view to the OpPoint View by clicking the menu item View→OpPoint View or by pressing the F5 key. Figure 2. The OpPoint View gives you a traditional cross-section view of an airfoil. At the bottom of the window, you can see airfoil characteristics, such as the thickness. Let's say that the first design change you need to make is to generate a thinner airfoil. You can do this by clicking the menu item Design→Scale camber and thickness or pressing the F9 key. This pops up a new window where you can change those characteristics. Figure 3. A new window lets you change the thickness and camber of your airfoil. When you make your changes and click OK, XFLR5 will ask you if you want to overwrite the current airfoil or if you want to create a new one. If you choose to create a new one, you will be able to switch between the various loaded airfoils using the drop-down at the top of the window. Now, let's generate the polars to do some analysis on this new airfoil that you created. The easiest way to do this is to click the menu item Analysis→Batch Analysis. If you have a multi-core or multi-CPU machine, you can select the Multi-threaded Batch Analysis menu item instead to get it done more quickly. This pops up a new window where you can select the range of Reynolds numbers to do the analysis over, and the step size for each Reynolds number to use. You also can select whether to do this for only the current foil, or you can do the analysis for a list of foils. 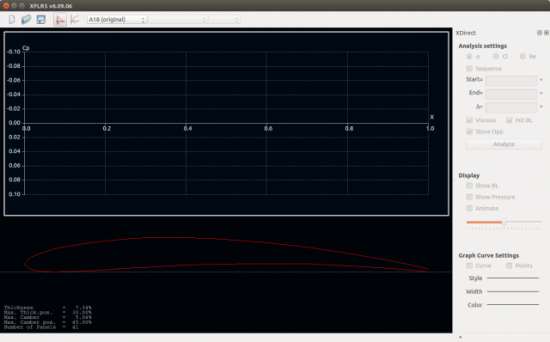 Once you have all of the parameters set, you can click on the Analyze button at the bottom of the window. For each step, you will see an output message in the top right-hand pane telling you how many iterations were needed for convergence, and in the bottom left-hand pane, you will see the actual plotted values for each iteration of each step. Once it finishes, you can close this analysis window and go back to the main window. The polar view will be opened automatically, showing you all of the polar plots. You can select a single polar plot of interest by clicking on the menu item Polars→Polar Graphs, and then selecting the graph you want to see. Figure 4. There are several polar graphs showing you the results of your analysis. Now that you have a foil and its polars calculated, you can move on to three-dimensional analysis and look at a full wing design. Clicking on the menu item File→Wing and Plane Design will pop up a new view where you can design a new full wing. Within this new view, you will need to click on the menu item Wing-Plane→Define a New Wing to open up a new window to create your new wing. Figure 5. Once you analyze your airfoil, you can start designing a full wing. You can give it a name and description, and set all kinds of characteristics. 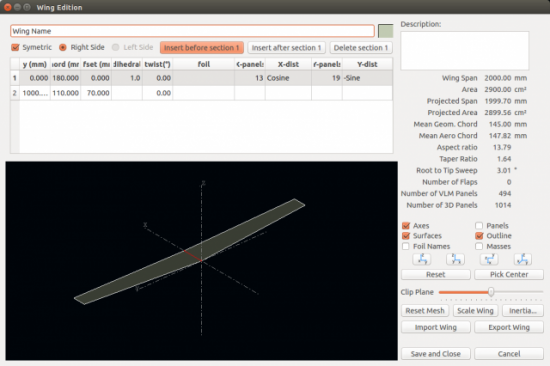 You also can select sections of your wing and use the airfoils that you designed in the earlier step to provide the cross-sections of the wing along its length. Once you are happy, you can click on the Save and Close button and see your new wing displayed in the main window. You now need to test your wing and analyze how it will behave when it starts moving through the air. Clicking on the menu item Analysis→Analysis Definition will bring up a parameter window where you can set up the details of your analysis. Figure 6. You can do an analysis of the entire wing as a whole. Once everything is set, click on the OK button to get back to the main window. Depending on what you are trying to do, you may need to set some advanced settings by clicking the menu item Analysis→Advanced Settings. Here, you can change items like the maximum number of iterations, the relaxation factor or the panel boundary conditions. 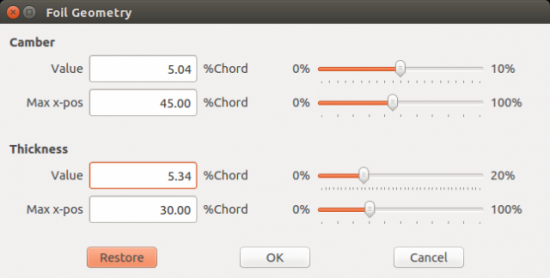 The final step is to set the number of sequential steps in the right-hand pane, under the analysis settings section. Clicking the Analyze button in the right-hand pane starts off the whole process. You also can design an entire plane, which is made up of one or more wings as well as a tail and fins. You can do this by clicking on the menu item Wing-Plane→Define a New Plane. In this part of XFLR5, you can define your entire plane and see how it behaves as a complete object. With XFLR5, you now can design your very own aircraft wings. This tool should be helpful for anyone, but especially for hobbyists who are designing their own RC aircraft. Cost is no longer a barrier for letting your creativity run wild. You might come up with a totally new, awesome wing design. You can find more documentation at the main XFLR5 Web site, which can help you do more complex analysis. Some of it was written based on older versions, however, so the location of certain functions within XFLR5 has moved, and you may need to do some investigative work to figure out how to do similar tasks. But, it is definitely worth the minor amount of work involved.